With its origins in the creation of a nursing degree qualification at the University of Milan in 2000, the Humanitas brand has come a long way. Now boasting a 17-year legacy enveloping healthcare, medical research, and study, the school has international aspirations, striving for recognition among healthcare students, scholars, and professionals globally. The group’s growth means that it is also proliferating in terms of architectural achievements. 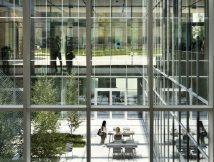 Alongside projects cropping up in other locations across Italy, a freshly-built campus has become the new HQ of Humanitas’ Milan operation, the Humanitas Research Hospital, located 800 metres south of its predecessor – the Instituto Clinica Humanitas hospital. The new complex is entitled the International Faculty of Nursing, Medicine and Physiotherapy. It greatly enhances the group’s capacity to deliver its 11 courses – including an advanced postgraduate course in Cardiovascular MR Imaging, and Masters degrees in endoscopy and urology – with purpose-built spaces and state-of-the-art facilities. Filippo Taidelli, founder of Milan practice Filippo Taidelli Architecture (FTA), led the campus’ design. His collaboration with Humanitas began 10 years ago while undertaking comparatively modest interior design work, and gradually grew to his current role as design ambassador for the group, which now provides the practice’s primary stream of work. The design of the new Milan campus aimed to weave the client’s founding philosophy into its fabric across a site covering 90,000 m2, situated at the boundary between Rozzano, an abandoned industrial sprawl in the south of the city, and Parco Sud, its largest green area. “Because they had never built a university they didn’t know what to do” explains Taidelli, giving a feel of the exploratory nature of this project for the client. “They already had a concept done by their design team with an entire master plan development. But I completely changed it.” The design of the project was driven as much by strong overall formal principles as much as by academic adjacencies. 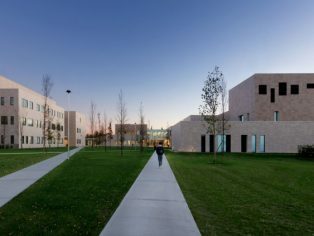 Clustered around a central piazza, are three contrasting primary buildings: These comprise the ‘didactic’ building, which accommodates the majority of the classrooms and administrative spaces; the Hub, a more social area containing the canteen, bar, and library; and, closing the courtyard, a relatively “severe and austere” research centre, aiming to “somehow reflect the function of its interior spaces.” The briefing process was less concrete, with the client releasing information in ‘trickle-down’ fashion. “Step-by-step I received more specific information about the quantity of students, 1000, information about classrooms, and office areas,” Taidelli explains. In terms of overall internal layout, the main public areas are located centrally within the buildings, while classrooms and labs are located at the periphery, benefitting from a connection with the outdoor landscape and natural light. The ‘didactic’ (teaching) building houses, on its basement level, a world-class simulation lab. 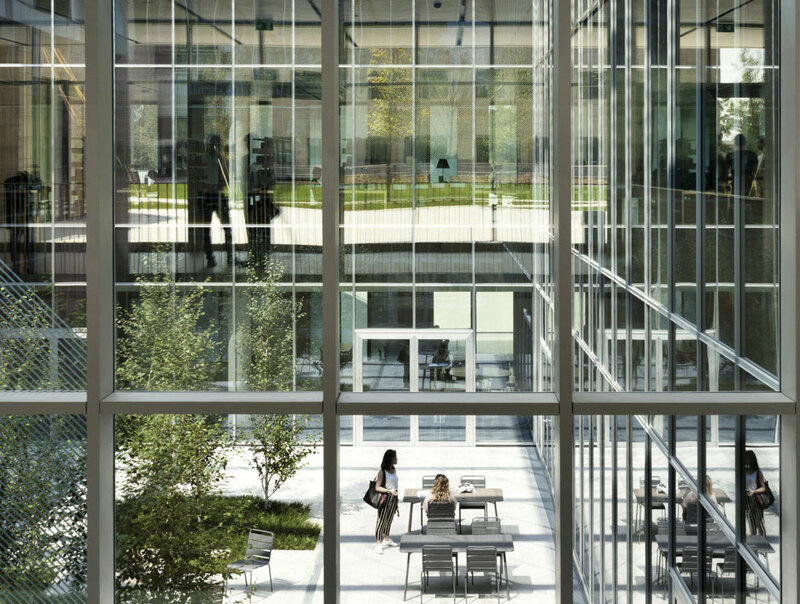 At ground floor level, the deep and open-plan central common areas grow outwards into classrooms and auditoria of varying sizes, with the first floor housing professors’ offices, plus administrative and rectorate quarters, separated respectively into two distinct volumes. The most challenging part of the brief to achieve, Taidelli notes, was: “Trying to give a dimension to the common areas – especially the hub’s public activity areas, so this internal programme was a bit more complicated than simply a typical institutional building.” Here, the purpose was “to combine two seemingly contrasting needs: the privacy required by spaces designed for studying; and institutional functions with the transparency and airiness required by the common areas in the halls.” The latter manifest as interior squares where students can both continue their study activities in informal spaces, or have a coffee break between classes. “In this way,” continues Taidelli, “the fluid space of pathways and living areas merge into a single organism that guarantees physical and visual continuity of the spaces dedicated to students, avoiding obstacles to their comfort and ensuring flexibility.” In the Hub, the basement level is largely given over to a large dining space and supporting self-service area and kitchen. The ground floor presents a central outdoor patio area, forming a kind of inner atrium walled with glass. The programme combines the library, bar, study hall and more casual study areas which seep into the smaller first floor to afford a wealth of flexible working spaces. The research building has a somewhat more regular layout. Its roughly cuboidal form is bisected internally by two corridors running the length of the building at each level. These provide access to a number of office rooms and laboratories, as well as a recreational area for breaks which serves tea and coffee. The philosophy underpinning the Humanitas Group is all about maintaining a close-knit integration of healthcare, research, and education. The three new buildings skirting the central piazza are representative of this “triangle of knowledge” – forming a centrepiece around which the rest of the campus would grow. 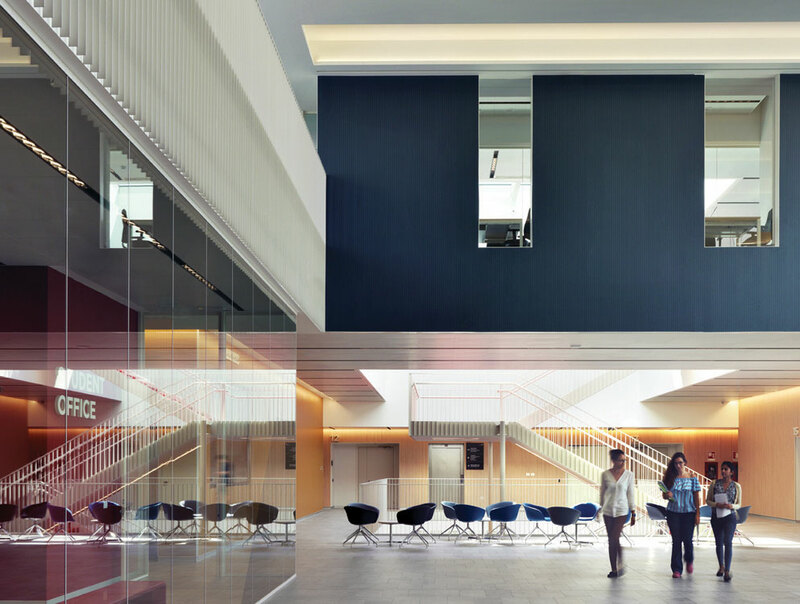 While the design is led extensively by the pursuit of form; function is also carefully woven into the campus’ architecture. The common spaces were made as “open, connected, informal, and fluid as possible.” With the inclusion of large indoor patios around the staircases, glass partitioning, as well as double-height and open spaces: “You never feel like you’re in a one-floor box – you can always see into another floor or another space.” Exterior noise is attenuated using a ventilated facade and a sound-absorbing coating to internal walls, which assists acoustic insulation between rooms. Further micro-perforated acoustic panels in bright and primary colours – crimson, orange, and teal – were specified for the interiors to reduce echo in the many open interior areas and make the classrooms more welcoming, all the while providing a more effective and inspiring learning environment. Classrooms were designed with flexibility in mind: “There are different ways of teaching; the institutional frontal way with the teacher at the front and the students facing towards him or her, for example. But, they wanted the opportunity for flexibility – to connect and divide rooms, and form more informal environments,” explains Taidelli. Some classrooms in the didactic building are divisible with optional partitions. Break areas outside classrooms are connected to terraces and the outdoor parks provide spaces to relax between seminars. Thought to be a world first in medical education, Humanitas Group’s new simulation lab was configured in strict accordance with traditional design conventions for hospitals – in order to serve its function of a sterile, clean environment giving a realistic impression of a clinical environment to practicing students. Practice areas have been fitted with mirrored glass to allow assessors to observe and evoke in trainees a sense of individual responsibility. When it came to sustainability, the designers were aiming for the Italian certification CENED. Geometries were configured for optimal sunlight and appropriate shading, including cantilevered volumes that form canopies over glass areas to reduce heat trapping, and further cooling provided by the building’s ventilated skin. With groundwater situated at just 1 metre below the level of the land, the campus takes advantage of a ground-storage heat using heat pumps. Photovoltaic and reflective panels on each of the three buildings provide clean electricity to the building’s users and reflect warmth in the summer months. Trees and greenery were positioned to provide shading to the facade in summer months, too. The campus’ user group is composed not only of students and staff, but patients and their families can also enter and make use of the campus’ bar, canteen, and more: “It’s an open environment on many levels,” says Taidelli. Feedback from the Humanitas Group has bolstered this. They are, according to the architect, particularly “impressed by the fluidity of spaces and natural light inside – the austere exteriors mean that people often don’t expect the light within. People also appreciate the use of colours on the interior walls.” For Taidelli, there’s no congestion – “the spaces simply work.” For now, the campus continues to grow. 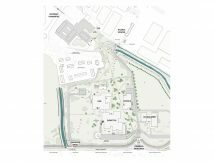 A fourth building housing the living quarters for 240 students is being added to the plot as the first phase of an extension. 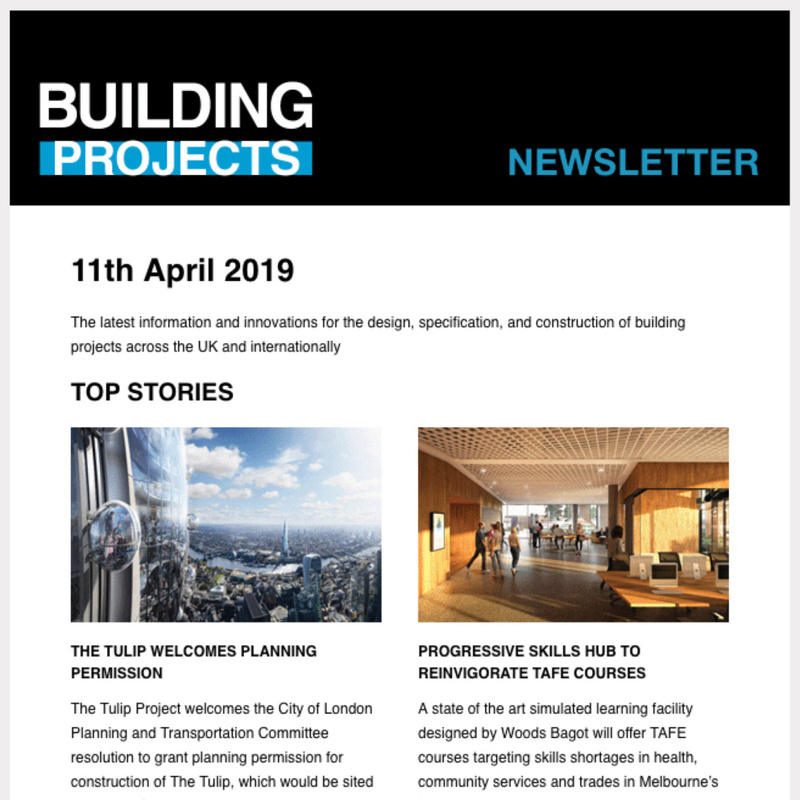 Slightly offset to the south east of the central courtyard, the new accommodation will be more regular in form than previous builds, but will continue to echo Taidelli’s clean and clear ethos.